The 2018 HER will open an international dialogue on Reinventing the Public Mission of Higher Education: Policies and Practice. The goal is to provide a platform for researchers, senior higher education policymakers, and higher education leaders who seek to expand engagement in this question and to explore and promote new solutions at local, national and international levels and sharing best practices. International conferences on Higher Education Reform (HER) have taken place annually since 2003, when the first in this series was held in Vancouver, Canada, organized by the Centre for Policy Studies in Higher Education and Training. 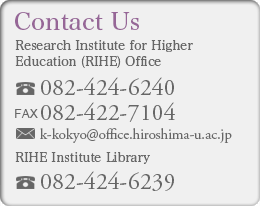 In previous years, conferences took place in Tokyo (Japan), Shanghai and Tianjin (China), St. Johns, Newfoundland and again Vancouver (Canada), Vienna (Austria), Berlin (Germany), Ljubljana (Slovenia), Dublin (Ireland) hosted twice, most recently in 2016, and Hiroshima (Japan) in 2017.